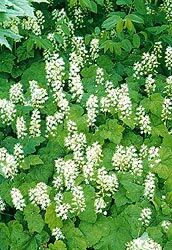 Tiarella comprises a small genus of very useful shade plants that are grown both for their arresting flowers and pleasing foliage. Foamflower’s tall, slender stems rise rapidly in spring and are soon covered with puffs of tiny, white flowers, which from a distance (or up close if you’ve misplaced your glasses) resemble sea foam. In bloom, plants range in height from 10-15” depending on varieties. Their basal mounds of lobed, maple-like green leaves remain interesting all season; foliage on some varieties turns bronze in fall. ‘Butterfly Wings’ (light pink bloom, maroon central vein), ‘Iron Butterfly’ (white flowers), ‘Jeepers Creepers’ (cream flowers, dark coloring around central vein), ‘Pink Bouquet’ (pink flowers) and ‘Spring Symphony’ (dark pink flowers, black blotching around veins) are noteworthy varieties. Soil should be humus rich, moist, and slightly acidic, though plants adapt well to most soils. Plants perform well in light, partial, or full shade. Avoid intense afternoon sun. Deadheading spurs reblooming. Divide in spring. If a portion of your property contains woods, foamflowers are great planted along the edge of the woods to ease the transition from yard to trees. Zones 3-8.